There is simply no comparison between Melania Trump’s Response to Hurricane Harvey compared to Michelle Obama’s response to Hurricane Sandy. Why? Michelle Obama didn’t even show up after Sandy. But Melania was there in Texas right beside her husband looking to comfort and help those affected by the storm. She wasn’t off vacationing with some celebrity like Mooch tended to do with Beyonce and others. 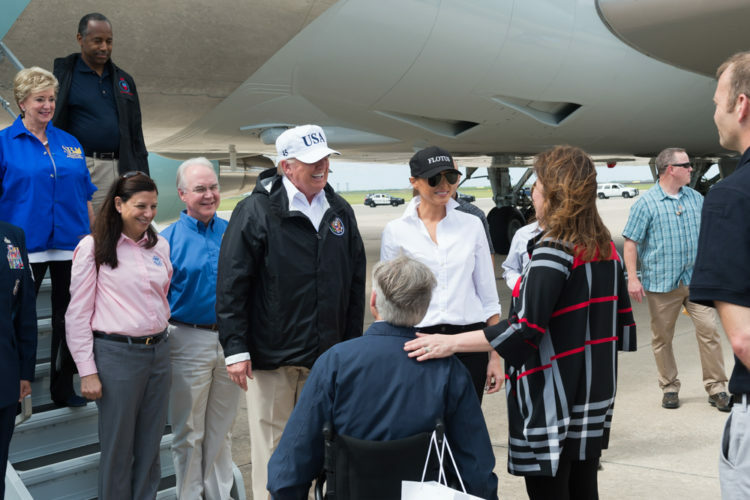 The Trumps were in Texas to discuss rescue efforts and relief for Texans. Trump proudly waved the Texan flag while being there for Texans. You never saw that from Obama or his significant other. What did the media concentrate on? Melania’s stiletto heels that she always wears and wore on her way to the waiting helicopter. 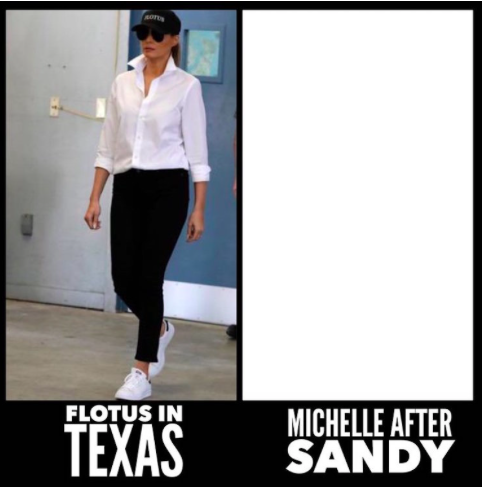 She then changed into tennis shoes, black slacks, a simple white blouse, shades and an awesome FLOTUS hat before landing in Texas and that triggered the media even more. Seriously, the media fixated on those shoes for a good part of yesterday trying to paint Melania as a wealthy elitist who is out of touch with Americans. Except those are Melania’s normal shoes and she dresses specifically for all appearances. When it was appropriate, she put on sneakers. That’s just how desperate the media is to nail the Trumps. SMH. Americans saw what the media was doing and they were livid over it. It didn’t surprise me in the least. They hate the First Couple and will seize on even the most minor thing to try and smear them. It’s just another indicator that the mainstream media is nothing more than a propaganda arm of the left. They should be embarrassed that Mooch never bothered going to New Jersey after Sandy hit them so hard. They can’t say that about Melania, but I’m sure they would have if she hadn’t gone. Not only is Melania a First Lady of the people and shows it by going to Texas, she shows it in yet another major way. She has nineteen fewer staffers than Michelle Obama did. Instead of pretending to be a queen with a court of sycophants, Melania acts and comports herself like an actual FLOTUS. Melania has five staffers versus the 24 that waited on Michelle Obama hand and foot at great expense. In fact, the Trump staff has 110 fewer staff members than the Obamas did. That will save approximately $22 million over four years. Plus the savings on Trump donating his salary from the White House. I call that yet another form of loving America and helping her repair the damage from the Marxists who ruled in the White House for eight long, destructive years. I call it America’s dark ages.